Woody Allen’s meandering trifle Café Society loses itself in nostalgia, much like several of his recent pictures from his dreamy comic triumph Midnight in Paris (2011) to his lesser, easily forgettable Magic in the Moonlight (2014). Although it looks lavish and boasts a fine cast (as usual), Allen’s forty-sixth feature never feels like more than an excuse to reminisce about the glory days of Hollywood and New York City, and their respective nightclub scenes. Not that his evocations of a romantic and classical bygone era aren’t welcome; however, the octogenarian writer-director doesn’t inject the material with the same vitality as breakthroughs like Blue Jasmine (2013) or Irrational Man (2015). Narrated with his own, distractingly raspy voice, Allen tells a broken-hearted love story when he’s not dishing on gossip and showcasing the parties of the 1930s, but he doesn’t imbue his anecdotal film with his usual substance. Jesse Eisenberg (who appeared in Allen’s To Rome with Love, 2012) stars as a typical Allen protagonist, Bobby Dorfman, a twentysomething nebbish and Bronx native who heads to California to get away from his bickering Yiddish parents (Jeannie Berlin and Ken Stott). After a lukewarm reception from his uncle Phil (Steve Carrell), a talent agent to major stars like William Powell, Bobby falls for Phil’s secretary—the ingénue Veronica, aka “Vonny” (Kristen Stewart), who arrived in Hollywood from Nebraska a year earlier and has since given up her dreams of becoming a starlet for a more down-to-earth existence. Despite Vonny carrying on with an unseen married man, Bobby falls for her and maintains his pursuit, all the while appreciating the Hollywood scene from a distance and fondly remembering his neighborhood back home. Soon, Bobby discovers Vonny’s married lover is none other than Phil, who refuses to leave his wife, Bobby’s aunt, for Vonny—at first, anyway. This sends Vonny running into Bobby’s arms for an all-too-brief fling. A theme emerges in Café Society, contrasting the triviality of Los Angeles and the film industry against Allen’s beloved New York, and much of Bobby’s dialogue consists of fond remembrances of New York early in the story, whereas later, when he moves back home, he’s dismissive of the West Coast. On the periphery are New York characters who feel less connected to the central story of Bobby and Vonny. 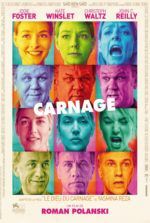 Corey Stoll appears as Bobby’s gangster brother, Ben; Parker Posey and Paul Schneider play a blithe socialite couple; and Blake Lively appears as a glamorous recent divorcée. There’s also a meandering subplot about Bobby’s elder sister Evelyn (Sari Lennick) and her intellectual husband (Stephen Kunken) who are having trouble with an aggressive neighbor. When Evelyn complains to Ben about the situation, Ben resolves it the way he resolves most unpleasant people: by digging a hole and filling it with freshly poured concrete. Integrated into the dialogue are period-specific references and talk of then-modern celebrities. Allen’s love of classic cinema is evident; although, his references are superficial at best. Compare Café Society to Joel and Ethan Coen’s Hail, Caesar! from earlier this year. Allen’s film mentions famous stars by name—there’s talk of Paul Muni, Ginger Rogers, Joan Crawford, Robert Taylor, etc.—but they’re merely name-dropped into the story. “Errol Flynn was with a young girl he called one of his ‘discoveries’”, someone mentions, or “Barbara Stanwyck is my favorite actress,” says Vonny. The Coens avoided namedropping and instead captured the spirit of classic Hollywood, recreating Golden Age movie sets and studio lots. Both Allen and the Coens adore the history and legend of the early studio system, but only the latter filmmakers demonstrate an appreciation beyond the conversational, whereas Allen has resisted California and Hollywood—both physically, and in his films—for years. At the production’s forefront, legendary cinematographer Vittorio Storaro (Apocalypse Now, The Last Emperor) delivers gorgeously composed and lit shots of production designer Santo Loquasto’s sets, bathing California scenes in a sun-drenched glow and New York scenes in cooler colors. Less impressive is the interior of the Manhattan nightclub that Bobby and Ben co-own later in the film; far too well-lit and populated by an eyebrow-raising number of senior citizens, the club hardly feels like a posh nightspot. 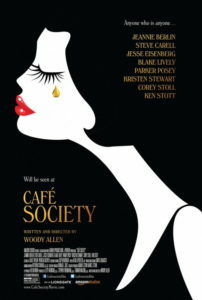 (After all, “Café Society” was a term coined by journalist Maury Henry Biddle Paul in 1915 for the high-class party life of beautiful people in cosmopolitan cities.) Still, even some of the younger cast feels misplaced. Allen fills the backdrop with supermodel types in Suzy Benzinger’s gorgeous costumes, but their elongated features look far too modern for his chosen period. Likewise, Lively’s orange-tanned appearance seems distractingly out of place in this setting, as do Stewart’s very modern voice modulations and body language. Pairing Eisenberg and Stewart together again after the underrated American Ultra (2015), Café Society, more than any Allen film in recent memory, feels like a jumbled hodgepodge of ideas. Either the Bobby-Vonny love story gets in the way of Allen’s “Café Society” anecdotes, or the narrated tales about classy parties get in the way of his love story. These two strains certainly don’t feel essential to one another. Quite famously, Allen writes down ideas for his films on napkins and random pieces of paper, and he keeps those scraps and scribbles in a drawer in his office. Every once in a while, he takes out one of his ideas and develops it into a screenplay. For Café Society, it feels as though Allen cleaned out his drawer and wrote around several scraps, loosely connecting them by creating familial associations in Bobby’s life. From a brother with a criminal streak to inconsequential observations about the New York nightlife, Allen’s tale remains pleasant but trivial throughout.